Raise your Steins and enjoy some fresh German brews. Travel aboard a double-decker bus in Manhattan for some genuine German bier at several different German bars and restaurants. 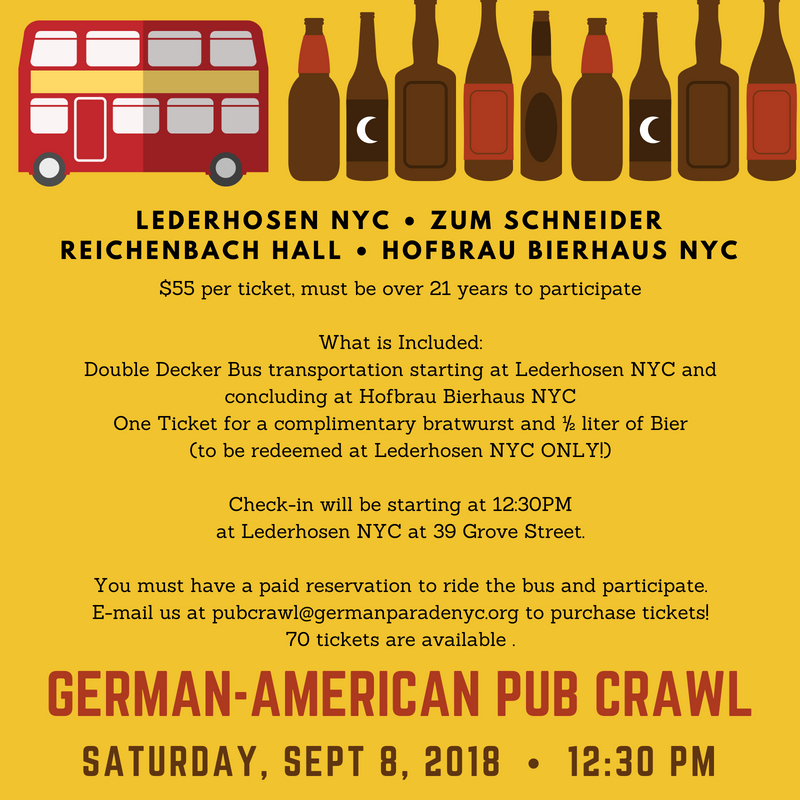 Tickets: $55 Includes travel on the bus, the first 1/2 liter of beer and one bratwurst at Lederhosen NYC. Additional beer and food is purchased separately. This event sells out very quickly, so make your reservation now! You must have a paid reservation to ride the bus and participate. To purchase tickets, e-mail us at pubcrawl@germanparadenyc.org. We will then send a private PayPal link to order your tickets within 24 hours. There are no surcharges incurred by you for the use of Pay Pal. 70 tickets are available. We will keep an additional list for either standby passengers. The bus rides rain or shine! No refunds will be issued once a ticket has been purchased. Other than the initial bratwurst and ½ liter of Bier, food/drinks are not included. Cash and credit cards will be accepted at each location. Because we ride rain or shine, bring a cheap poncho in the event it does rain!! We have had a few rainy days before and it has always been a blast anyway! Please bring your Pay Pal receipt and a matching ID in order to prove identity when you check in. We will issue you a pass and the ticket for the free beer and brat at that time. Again, that brat and half liter are only good at LederhosenNYC. Check-in will be starting at 12:30PM at Lederhosen NYC at 39 Grove Street. All passengers must be 21 and over to ride! We cannot accommodate anyone without proper ID.